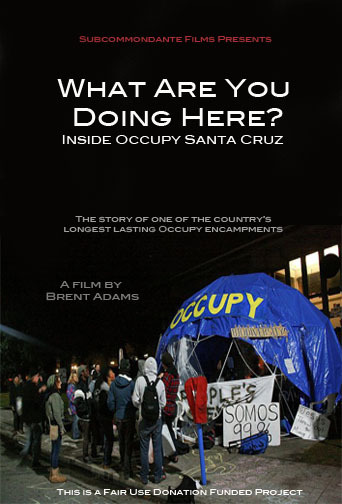 Local Activist & Documentary Filmmaker Brent Adams camped with Occupy Santa Cruz and captured many pivotal moments of the local movement. This feature length documentary offers an inside view of one of the country's longest lasting Occupy encampments. Occupy Santa Cruz successfully hosted a camp of 200 tents for nearly two months. They faced down early morning police raids and a campaign of lies by city police and county administrators that were reported unchecked by a vindictive local TV news department. Notorious Anonymous internet hacker "Commander X", the Vice Mayor of Santa Cruz, the Deputy Police Chief and a prominent local attorney join a cast of hundreds who try to navigate the space between the law and the tenuous freedom afforded by a national people's movement. Brent Adams handles the fast breaking action deftly as he shoots on the hoof and then edits it in a style that allows viewers to come to their own conclusions. The film includes music by some of the Bay Area's best electronic music producers. Celebrate in the park where Occupy Santa Cruz was born! "What Are You Doing Here? Inside Occupy Santa Cruz"
PLUS subversive shorts, great company and a guaranteed good time! BRING blankets, pillows, anything you need to be comfortable in the great outdoors friends, snacks to share. Donations to support the project are more than welcome. Occupy Santa Cruz continues to hold General Assemblies and hosts various monthly actions and working groups to engage the community of Santa Cruz.